Blurb Description:"Tell me that and we'll go. Right now. Save ourselves and leave this place to burn. Tell me that's how you want your story to go and we'll write it straight across the sand." 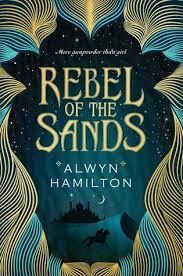 When I first looked at the cover of Rebel of the Sands, I knew that it was a book I had to have. I didn’t care what it was about, this was cover love at first sight. My love only deepened when I actually read what the book was about: ‘A Sharpshooter. A Dreamer. A damn good liar.’ and I had chills running down my back! To be quite honest, I don’t think my words can quite capture the essence of what this book has in store for you when you pick it up (because you REALLY should) so I’m going to try and capture it from some of the many lines that were so awesome, I HAD to re-read them over and over. You know badass heroines, right? We all love them. There’s Katniss Everdeen and Celaena Sardothien and Mare Barrow. Here’s the thing though, how many of said actually SAID they were badass, because Amani does. And Amani is AWESOME! She’s a fearless dreamer with perfect aim and a will to live, and I assure you, you will LOVE her. I loved that in the middle of an Arabian Night’s story, we had FEMINISM, and equality and non-discrimination. These were really life issues that every girl in the world faces – East or West – and Alwyn handled it all brilliantly. The blurb promises you rebellion and love and magic, and IT DOES NOT DISAPPOINT! From the stories of Djinn to Ghouls to Skinwalkers, to the passion between Jin and Amani and through all the characters with their dangerous powers and powerful personalities, this book will grip you and never let go. What do you guys think of that cover? Who is your favourite Badass Heroine? Let me know what you think - I love hearing from ALL of you, and I will also be sure to stop by your FANTASTIC blogs!